If it hadn't been for the popularity of Walt Disney’s The Jungle Book, the history of drag racing might look a whole lot less colorful because the film was still on the minds of many when a man named Tom McEwen began competing in regular races against Don “The Snake” Prudhomme. And although they were infinitely well-matched on the racetrack, because they couldn’t have been more different in real life given Prudhomme’s serious, studious approach to the sport in contrast to that of laid back, smooth talking ladies man Tom McEwen, it didn’t take very long for people to start calling Tom “The Mongoose” who lived to chase "The Snake" around the track. Admittedly as depicted in director Wayne Hollway’s fast-paced feature length biopic about the pair, the name took some getting used to for Tom, who wasn’t sure how to take it at first. 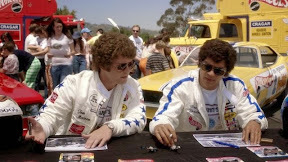 However, he soon latched onto in full force, cleverly taking the source material into consideration to become a walking PR campaign for the Tom McEwen brand, wearing Mongoose t-shirts and gradually talking his off-track friend Don Prudhomme into making a much more successful living as his two-decade spanning on-track rival. Turning the formerly unpopular sport that only attracted gearheads and their girlfriends into a profitable family friendly industry that at last put them in the veritable driver’s seat of their prospective careers, Tom and Don went from barely scraping by to making a good living putting on exhibition races in hot-spots throughout the southwest. Yet as in-demand as they were on the road, the demands of the road began taking their tolls on their loved ones back home -- in Tom’s life in particular as his marriage began to lose momentum just as his career began picking up speed. Inspired by his children’s love of toy cars, whether consciously or not Tom went back to the Disney well that had given him his name and image, teaming up with Don and Barbie manufacturer Mattel to dream up the idea of Hot Wheels with their animated logos painted on the side of the cars. More psyched about the financial ability that Mattel’s corporate sponsorship would offer the brainy Don to build his ideal dream car than the children’s toys as he and his wife had put off having children temporarily due to the dangers of the sport, when Hot Wheels exploded in a big way, neither the Snake nor Mongoose had any idea what would happen. 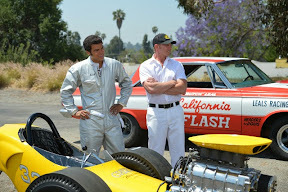 Amping up their professional rivalry even more as the recurring champion Don’s Snake racer routinely outsold the Mongoose’s number two seller, when Mattel began to use their legalese to state when they needed to drive a car and which race type was in need of a commercial tie-in, tension began to build between Tom and funny car race weary Don. Both driven to win but with vastly different approaches and personality types, while Don was in it for the love of engines, the PR savvy, fan-friendly Tom was often sidetracked by his love of the spotlight. Yet as Holloway’s riveting film reveals, neither man is any one thing as the two learn from one another (whether they’re willing to admit it or not) over the course of their increasingly complicated dynamic when they’re hit with a few emotional roadblocks including one unexpected detour that forever affects both drivers on and off the track. 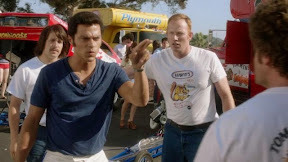 Well-acted by its talented ensemble led by the film’s remarkable duo of Jesse Williams and Richard Blake as Don and Tom respectively, Snake & Mongoo$e, which also features supporting work from Ian Ziering, Tim Blake Nelson, Kim Shaw, Ashley Hinshaw, Noah Wyle and Fred Dryer is a stunning achievement in independent filmmaking. 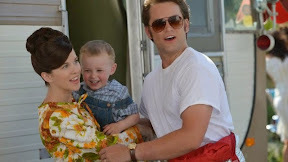 Passionately made with remarkable attention to detail from its colorful yet slightly over-saturated, warm ‘70s style cinematography to its mood-setting period soundtrack of deeper cuts than those traditionally served up in similar fare, Holloway’s film transcends its genre trappings as both a biopic and sports film right from its earliest moments when we hear Elvis Presley’s “Spinout” set to their first meet. 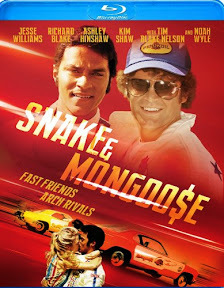 The very first film ever screened at 2014’s legendary Barrett-Jackson Scottsdale Auction in its 43 year history, Snake & Mongoo$e is sure to attract a larger word-of-mouth fanbase of viewers as more viewers discover the work outside racing events. Beautifully transferred to high definition Blu-ray, Holloway’s film about two of drag racing’s most famous drivers continues to coincide historically with the Disney movie that gave their famous alter-ego’s life. Arriving on disc shortly after the 50th anniversary of The Jungle Book, the amusing coincidence and great PR timing is an idea (almost) worthy of Tom McEwen himself and as such, it invites audiences to pick up both movies for an epic double feature as an animated snake and a mongoose move from the jungle to the racetrack.